Saudi Arabia, in a sudden turnabout has lifted its ban on women athletes competing in international tournaments little more than a week after the death of Crown Prince Nayef bin Abdul Aziz, an opponent of women’s participation in global sports events. It was not immediately clear what prompted the reversal that was announced in a statement by the Saudi embassy in London. A Saudi women equestrian is expected to be the conservative kingdom’s only female athlete likely to qualify for next month’s London Olympics. The kingdom does not encourage women’s sports, offer girls physical education in public schools or include women in its national sports plan. The embassy statement followed months of sea-saw pronouncements on whether women would be allowed to compete in London, topped in April by a statement by Prince Nayef categorically ruling out. Prince Nayef, largely viewed as a conservative hardliner with close ties to Saudi Arabia’s religious leadership was succeeded as crown prince by Prince Salman bin Abdul Aziz who is believed to be more liberal. "The kingdom of Saudi Arabia is looking forward to full participation" in the Olympic Games. "The Saudi Olympic Committee will oversee participation of female competitors who qualify," the Saudi embassy in London said. If indeed implemented it would mark the first time that Saudi women are allowed to officially participate in an international sports tournament and would mean that the kingdom no longer is the only country in the world that refuses to allow women to compete on a global scale. The embassy statement came at a time that Saudi women have been campaigning for greater rights, focusing on demands to lift a ban on women driving. Proponents of women’s driving submitted earlier this month a petition to King Abdullah with some 600 signatures. Women driving however has so far been a bridge too far for the king. Scores of women who defied the ban in the past year have been arrested and forced to sign pledges that they would not drive again. Manal al-Sharif was detained in May of last year for nine days after she videotaped herself flouting the ban on women driving by getting behind a steering wheel and driving. She was released only after signing a statement promising that she would stop agitating for women's rights. The International Olympic Committee which has been negotiating with Saudi Arabia about a lifting of the ban rejected at the time Saudi suggestions that Saudi women living abroad be allowed to compete under the Olympic flag rather than as part of the official Saudi delegation. International human rights group Human Rights Watch accused Saudi Arabia in February of kowtowing to assertions by the country's powerful conservative Muslim clerics that female sports constitute "steps of the devil" that will encourage immorality and reduce women's chances of meeting the requirements for marriage. The group’s charges contained in a report entitled “’Steps of the Devil’ came on the heels of the kingdom backtracking on a plan to build its first stadium especially designed to allow women who are currently barred from attending soccer matches because of the kingdom’s strict public gender segregation to watch games. The planned stadium was supposed to open in 2014. The report urged the IOC to require Saudi Arabia to legalize women's sports as a condition for its participation in Olympic games. The embassy statement takes on broader significance coming at a time that King Abdullah is seeking to counter attempts by conservative clerics to thwart his minimal reforms and circumvent post-9/11 restrictions on charitable donating, designed to prevent funds from flowing to militant Islamists. It’s a delicate balancing act for more reform-minded members of the royal family like King Abdullah who rely on the clergy to support the kingdom’s efforts to contain the Middle East and North Africa’s wave of anti-government protests that have already toppled the autocratic leaders of Tunisia, Egypt, Libya and Yemen and brought Syria to the brink of civil war. Some clerics have asserted that the protests stem from the mingling of the sexes in sports. “In the past it was only men, now it is almost half half (in stadiums). Allah knows what happens afterwards. Either way it is bad. Either people go out, they are sensing and partying and drinking and all that, so that’s negative. And if they don’t, they go out and they demonstrate and they’re angry and they destroy property and they destroy cars and they destroy people’s business. Either way its haram (forbidden), things have to be done in moderation,” said A Saudi-backed imam Abu Abdellah of the As-Sunnah mosque in Kissimee, Florida. His statement was in line with a series of pronouncements by senior religious leaders in the kingdom itself. 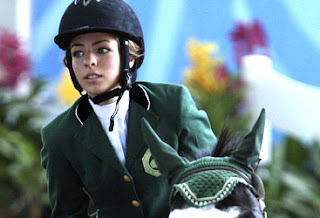 Show-jumper Dalma Rushdi Malhas is likely to be Saudi Arabia’s only female representative in London if the kingdom adheres to the new policy announced by its London. Ms. Malhas in 2010 became the first Saudi woman to compete in the Youth Olympics, where she won a bronze participating on an individual basis rather than as part of a Saudi team. "I am determined to give my best to reach their level one day, and prove that all women athletes, all over the world, should be given equal opportunities," 20-year old Ms. Malhas said in February at a conference where breaking with Saudi tradition she spoke with her hair uncovered. James M. Dorsey is a senior fellow at the S. Rajaratnam School of International Studies at Nanyang Technological University in Singapore, author of the blog, The Turbulent World of Middle East Soccer, and a consultant to geopolitical consulting firm Wikistrat.